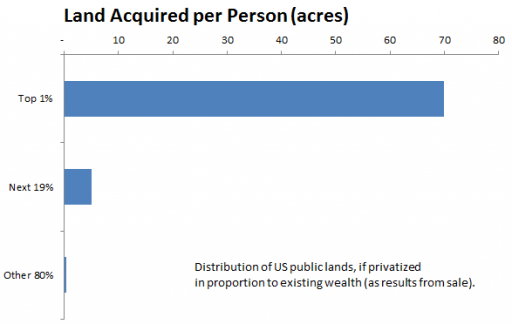 Privatizing Public Lands – Claim your 0.3 acres now! BLM Public Lands Statistics show that the federal government holds about 643 million acres – about 2 acres for each person. The Forbes 400 has a net worth of $2.4 trillion, not quite 3% of US household net worth. If you’re one of those lucky few, your cut would be about 44,000 acres, or 69 square miles. Bill Gates, Jeff Bezos, Warren Buffet, Mark Zuckerberg and Larry Ellison alone could split Yellowstone National Park (over 2 million acres). 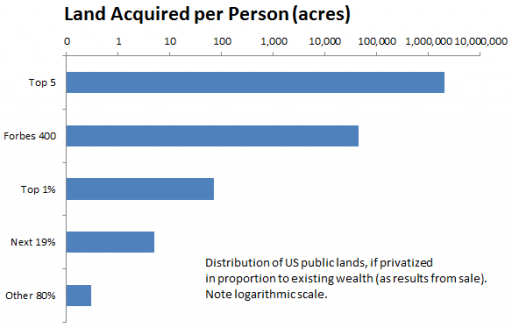 The top 1% wealthiest Americans (35% of net worth) would average 70 acres each, and the next 19% (51% of net worth) would get a little over 5 acres. The other 80% of America would split the remaining 14% of the land. That’s about a third of an acre each, which would be a good-sized suburban lot, if it weren’t in the middle of Nevada or Alaska.